Acupuncture is a key component of traditional Chinese medicine often used for pain relief. From cupping and acupuncture to tongue diagnosis and herbal medicines, Traditional Chinese Medicine (TCM) has been in existence for over 2,500 years and is already widely used in this part of the world. Today, the popularity of this ancient practice has grown rapidly, enjoying more global awareness than ever before. Affirming the recognition for TCM is the development of the city’s first Chinese medicine hospital, which is expected to open by 2024 in Tseung Kwan O. The foundation of TCM consists of two core concepts: the theory of qi (used to refer to the body’s “vital energy”) and yin-yang (the harmony of opposite elements and forces). An imbalance of this energy is believed to disrupt harmony and cause ill health. As a Western medicine enthusiast who bases her health choices on science and research, I have always been quite sceptical of TCM. I’ve not enjoyed the strong, bitter tasting medicines and was never too keen on having my back scraped with a spoon, so with an invitation to preview a more contemporary Chinese health club, I was curious to see how TCM could work for a modern audience and if I would ever be so inclined to incorporate this into my own life. The entrance to Hong Wo Lok Health Club in Tsim Sha Tsui. Hong Wo Lok is a private health club that combines traditional and natural remedies with a holistic approach for physical and mental health. Consultations and treatments such as tui-na massage, lymphatic detox, ginger moxibustion, meridian (the pathways of qi) conditioning, tea therapy and more, are all available for club members. 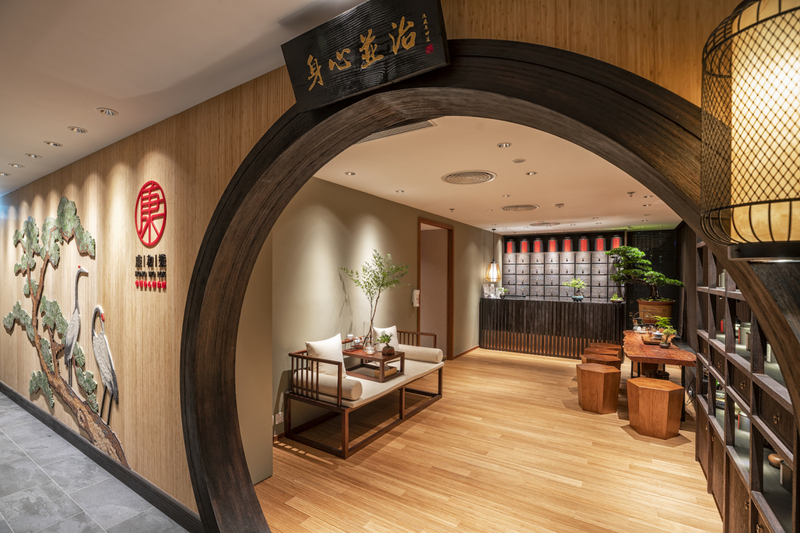 I arrive on the 16th floor and am pleasantly surprised, because unlike many other Chinese medicine clinics in the city, the newly opened health club occupies a bright and airy clubhouse in an unusually quiet area of Tsim Sha Tsui that’s surrounded by greenery. The 3,000-square-foot space holds six treatment rooms, two consultation rooms and a balcony, all designed with natural bamboo to emanate a tranquil energy that feels more like a relaxing spa than a health club. One of six treatment rooms at the newly opened private health club. My one-on-one consultation with the registered Chinese medicine practitioner began with a series of questions before he conducted some pulse and tongue diagnosis. Based on this, he found that my body constitution (there a total of nine different ones) is full of “dampness” and proceeded to formulate a personalised therapy plan which consisted of tea therapy, dietary recommendations and the manual treatment of fascia stretching. The dietary advice includes a list of foods to avoid and a list of items to consume more frequently to help cure my “damp” body. In my case, I was advised to drink less cold water and instead drink liquids that will warm up the body and limbs. He also advised to avoid sweets and dairy, but of course, I am never going to give up cake. I enquired some more and asked for some elaboration as to why dairy or sweets would affect my condition, but was not given a concrete answer and the doubts began to resurface as I was asked to believe without reason. A therapist helps you in the fascia stretching session to help deepen your stretches. I went on to try the 50-minute fascia stretching, which is said to reduce the tightness and adhesions of this fibrous tissue (the fascia) which wraps and connects muscles and organs. As one of the many people that sit in the office for a prolonged period of time, I enjoyed stretching out and found comfort in the fact that the therapist working to deepen my stretches was a trained physiotherapist. Though I’m not sure how much I actually stretched this connective tissue, I did find that my muscles felt more relaxed and the water retention in my legs had dispersed significantly. Finally, I was given some tea therapy, which replaces Chinese medicine at Hong Wo Lok (though still available if requested in herbal or granule form), and concluded my treatment. The tea leaves used were obtained from 300-year-old trees which are said to have absorbed more nutrients due to its expansive roots — resulting in a dark and strong tasting tea. The ‘stomach warming’ tea prescribed for me was a type of Pu’er to help digestion, and though my stomach didn’t feel much warmer at the time, I was happy enough to sit on the open-air deck and sip my tea. The open-air balcony reveals a bright view of city that is surrounded by greenery. The overall experience was enjoyable, and though it did not convert me into an avid TCM believer, there are some aspects of the therapy that I can definitely incorporate into my daily life. Namely the stretching, be it fascia or otherwise, as well as the tea therapy. Whether or not I believe in the powers of ancient tea leaves, I do trust in the therapy of relaxation — especially after several cups of warm tea away from the city and amidst serene surroundings. Hong Wo Lok is soon launching a new mobile app, available in English and Chinese language, which will help shape the future of TCM. It will offer a series of functions such as health tips, body reports and prescriptions, health trackers and also be able to make instant reservations, paving the way for a more systemised and modern version of TCM that the world has been looking for. Note: Membership starts from HK$10,000 and can be shared amongst family members. Non-members can come in by appointment to see the Chinese medicine practitioner and to purchase tea and medicine. All other facilities and treatments are reserved for members only.